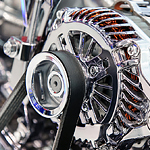 How Does Your Alternator Help Your Car To Function? Here at Lion Country Kia, we believe that our dedication to customer service should continue even after our customers drive off of our lot. As such, we want to help our customers get the most out of their vehicles by learning more about them. In particular, we think that drivers should be aware of how important your alternator is to your vehicle. When running smoothly, the alternator generates power for the electrical components in your car and keeps your battery charged up. Indeed, without the alternator, your battery would die very quickly. As such, vehicle manufacturers usually include a "GEN" or "ALT" sign on your car's dashboard to let you know when your alternator needs to be replaced. Our team of highly skilled mechanics is ready to handle all of your car's maintenance needs. Whether you want us to replace your alternator or carry out some other work, we are here for you. Just make an appointment at our service center in State College to see what we can do for you.